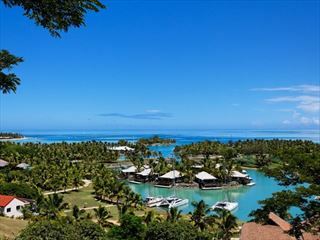 InterContinental Fiji Golf Resort & Spa, Fiji. Book at Tropical Sky today. 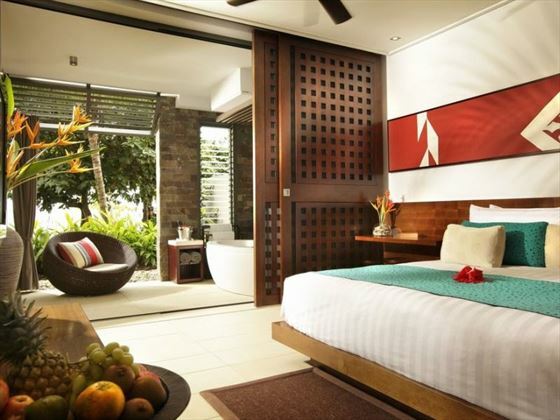 Spoil yourself with complete 5* luxury at InterContinental Fiji Golf Resort & Spa. 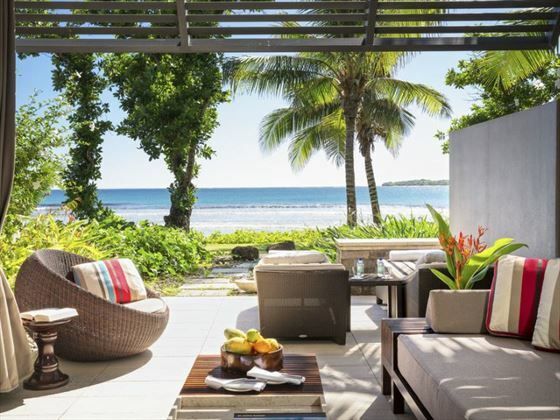 Nestled on the spectacular Natadola Bay on the Coral Coast of Fiji’s main island Viti Levu, this romantic escape offers an intimate and luxurious island experience, with authentic Fijian hospitality. Truly relax and rejuvenate at the InterContinental Spa, offering traditional Fijian treatments to heal the mind, body and soul, including warm shell massages and incredible aqua therapies. Fancy a bit of adrenaline? The resort has a number of fantastic water sports, including wake boarding and water skiing with their excellent Reef Safari, or head to Sanasana Restaurant in the evening for vibrant, exciting entertainment. At the end of the day, this extravagant resort is host to a variety of classy restaurants, including open kitchens at Vatu Lo Bar & Restaurant, and Intimate Dining in a private cabana with your own personal waiter. Once wined and dined, sit back and watch the sunset from your lavish room or suite, all with large balconies or terraces with their own perfect view. 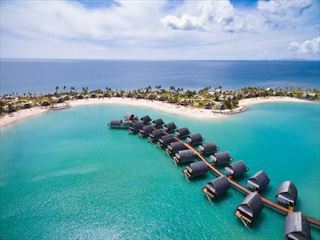 This luxurious resort is nestled on the breath-taking Natadola Bay; along the western coast of Fiji’s main island Viti Levu. 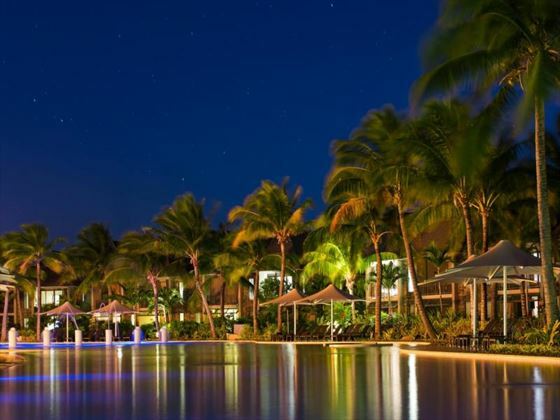 Sitting amongst 35 acres of tropical gardens with a sparkling ocean-facing lagoon, this resort’s location is beautiful, and offers a special, intimate ambience. Voted as one of the best beaches in the world by Forbes Magazine, Nataldola Bay offers guests a true insight into the island lifestyle. 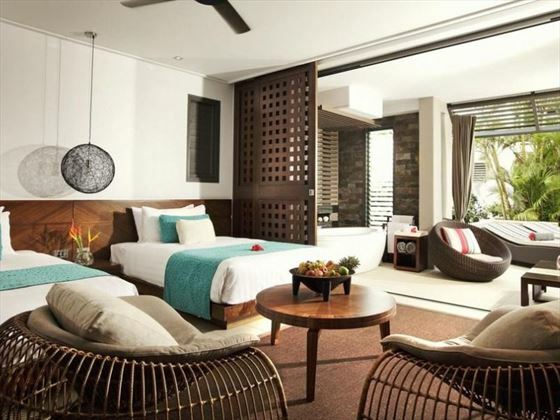 Garden View Room – Fresh 63sqm rooms close by to the resort’s facilities with views of the tropical gardens. Includes two double beds or a king size bed, plus an outdoor living space. Sleeps a maximum of three adults, or two adults and two children. Pool View Room – Colourful 63sqm rooms surrounding the central gathering area, with great views of the Family Pool. Features a private outdoor terrace. Sleeps a maximum of three adults, three adults and one infant, or two adults, one child and one infant. 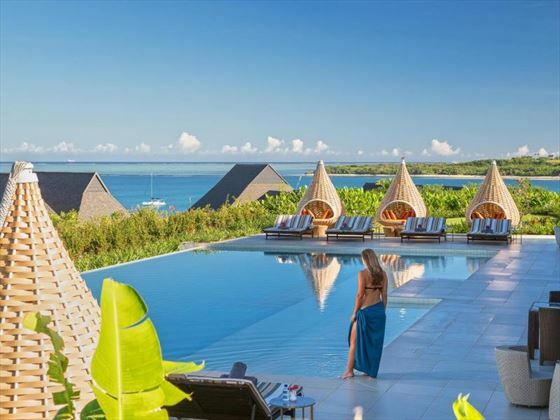 Lagoon View Room – Nestled on the edge of the Navo Lagoon, these secluded 63sqm rooms feature an outdoor terrace with lagoon style cabanas. Sleeps a maximum of two adults, or two adults and one infant. Lagoon View Suite – Located only a stone’s throw away from the lagoon with the same amenities at the Lagoon View Rooms, these 85sqm rooms sleep a maximum of three adults, three adults and one infant, or two adults, one child and one infant. Beachfront Room – Elegant 63sqm rooms nestled on the beach with a lavish outdoor living space, offering a front row seat for the beautiful sunsets. Sleeps a maximum of two adults, or two adults and one infant. 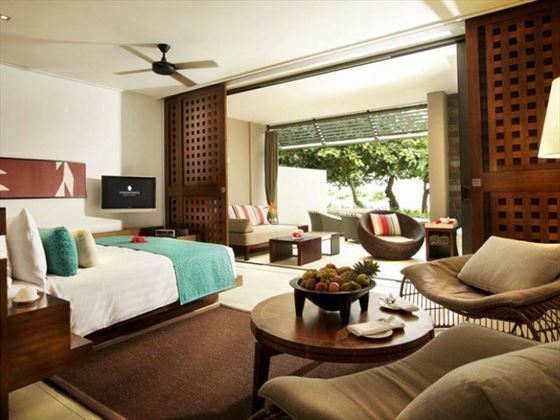 Beachfront Suite – With the same amenities and location as before, with 85sqm of space and incredible beach views. Sleeps a maximum of three adults, three adults and one infant, or two adults, one child and one infant. 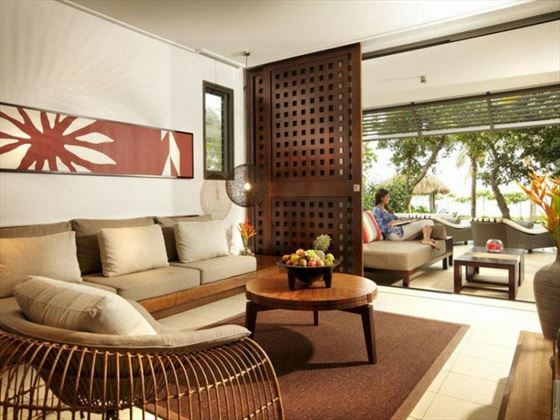 Club InterContinental One Bedroom Suite – Extravagant, spacious 115sqm suites featuring sweeping views of Natadola Beach, a private terrace, a king bedroom with en suite, a separate lounge and dining area, and *Club InterContinental amenities. Top floor suites have a private balcony, whilst ground floor suites feature a plunge pool and tropical garden. Sleeps a maximum of three adults, or two adults and one child over 12 years. Club InterContinental Two Bedroom Suite – Contemporary 156sqm suites with stunning views of the beach, featuring a king bedroom with en suite bathroom, a second bedroom with two single beds and en suite bathroom, a separate lounge and dining area, and *Club InterContinental facilities. Top floor suites have a private balcony, whilst ground floor suites feature a plunge pool and exotic courtyard. Sleeps a maximum of four adults, or three adults and one child over 12 years old. 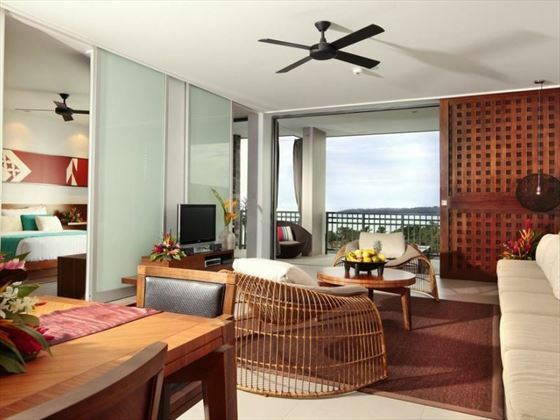 Natadola Suite – The embodiment of luxury, these 218sqm residential-style suites are nestled on a hilltop and offer panoramic views of the beach. 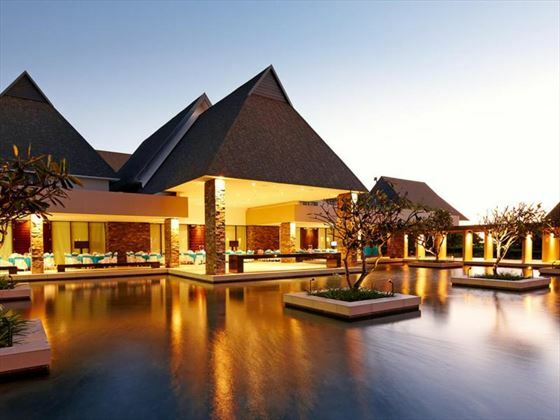 Featuring two bedrooms with en suite, a kitchenette, a lounge and dining area, a private pool, tropical garden, outdoor entertainment space, and *Club InterContinental facilities. Navo – Enjoy an elegant fine dining experience at this sophisticated restaurant. Overlooking the lagoon, the restaurant’s menu is inspired by the sea surrounding the resort, and has a great glass-walled show kitchen. No beachwear is allowed; please wear appropriate clothing and footwear. Open 5.30pm-11pm. Early sitting for families is at 5.30pm, and adults-only dining is available from 7pm. Sanasana – Sitting alongside the Sugar Cane train track, this hearty restaurant overlooks Meke Lawn and Natadola Bay. Serving a buffet breakfast, a la carte lunch, and a theme buffet dinner offering lots of seafood and premium meats. Open 5.30am-6.30am for continental breakfast, 6.30am-10.30am for full breakfast, 11am-4.30pm for lunch, and 5.30pm-10pm for dinner. Toba Bar & Grill – A chilled out restaurant and bar offering casual Fijian dining, including wood-fired pizza, burgers, desserts, and poolside cocktails. Open 11am-4.30pm, and 5.30pm-10pm. Kama Lounge – Overlooking Natadola Bay, this laidback lounge is the perfect place to sit back and relax with international and locally inspired cocktails and snacks. 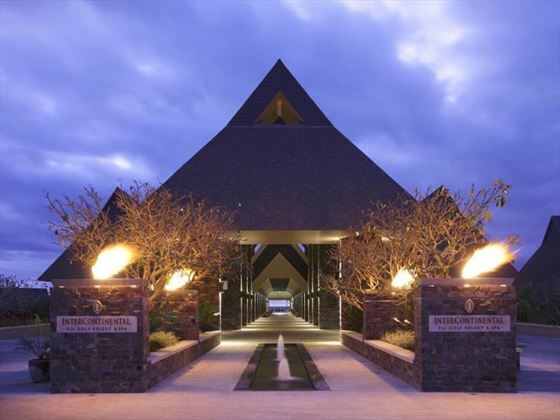 At dusk, enjoy a ritual torch lighting ceremony and daily entertainment, including fire dancing and tribal drumming. Open 8am till late, with Happy Hour from 5.30pm-7.30pm. 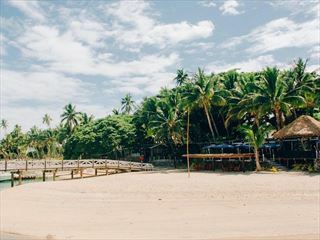 Vatu Lo Bar & Restaurant – Nestled above Natadola Bay Golf Course, this lovely restaurant has amazing views of the ocean, mountain ranges and coral reefs. Serving cool beverages and light snacks or meals with fresh and local ingredients – you can even watch the chef create traditional Fijian fare from the open kitchen. Bar open from 8am till dark, restaurant open 8am-2.30pm. Intimate Dining –Tuck into the ‘Taste of Fiji’ menu and be served by your personal waiter in a private cabana. Adult’s Only Infinity Pool – Overlooking Natadola Beach and offering small bites and cocktails, this gorgeous pool is available to guests aged 16 and above. Family Activity Pool – A 105 metre pool offering activities for families with young children. Club Lounge Infinity Pool – A private infinity edge pool specifically for Club Intercontinental guests, with lovely views and comfortable lounge chairs. Guests aged 12-18 years must be accompanied by an adult. Dive pool – Use of the pool must be arranged with the onsite Reef Safari team. This pool is dedicated to dive training, with qualified Dive Professionals on hand. 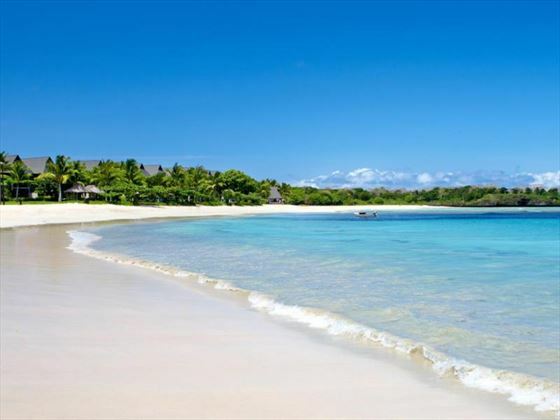 The resort is located on Natadola Bay, a beautiful stretch of white sand with a crystal blue lagoon. 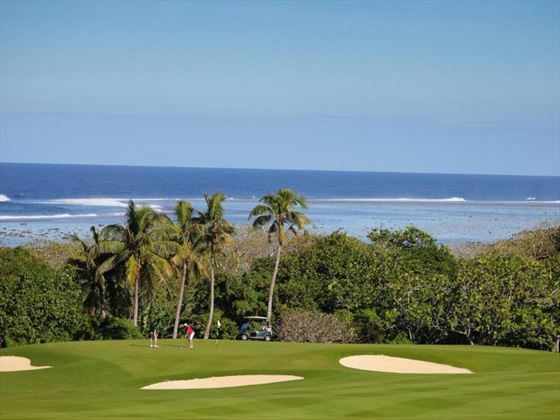 18 hole championship golf course - the 2017 PGA Fiji international Golf tournament is being held here. Spa InterContinental – A luxurious spa offering a blend of Asian, Eastern and Western treatments to balance the mind, body and soul. Enjoy pure relaxation with one of the signature treatments, including a traditional Fijian massage and warm shell massage, or get a spa therapy in one of the Tranquil Cabana Escapes – offering massages and facials using Pure Fujian products. There’s even a Yummy Mummy package targeting areas mum need it most, plus a complimentary kids club session so you can enjoy your visit in peace. The Orchid Room is great to book for a special occasion, and in between treatments, how about dipping into the Wai Zone? Fijian for water, this pre and post treatment area offers aqua therapy with water in all three states – gas, liquid and solid. Planet Trekkers Kids Club – Let the kids enjoy Fijian entertainment and activities at this brilliant kids club. Open for 4-7 year olds and 8-12 year olds. The club is open 9.30am-1.30pm (lunch included), 2pm-6pm (dinner included), and 6.30pm-10.30pm (dinner included). Teen Trekkers – Outdoor activities are available every day with the Recreations Team, including pitch and putt, beach football and beach volleyball. Nanny Service – Resort nannies are available, and can take children under the age of four to the Planet Trekkers Kids Club. Paid on an hourly basis, with a minimum of three hours each session.